Portland, Maine- The Portland Sea Dogs have unveiled new menu items that will be available at Hadlock Field in 2019. New items that will be available include Lobster Popcorn and the Fried Dough Burger. Additionally, the Sea Dogs have announced the creation of Foodie Friday's at the ballpark. 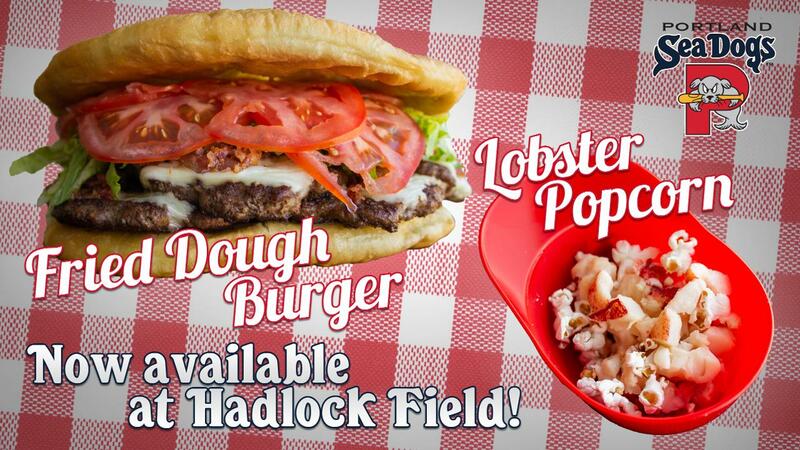 The Lobster Popcorn and the Fried Dough Burger will be available at every home game this season at the Shipyard Grill located behind the left field grandstand at Hadlock Field. The Lobster Popcorn consists of lobster mixed with popcorn topped with melted butter served in a mini Sea Dogs helmet. The Fried Burger includes eight patties, cheese, bacon crumble, lettuce and tomato with two fried doughs serving as the bun. "We are excited to offer these new menu items to our offerings this season," stated Sea Dogs President & General Manager Geoff Iacuessa. "The Lobster Popcorn offers a ballpark staple combined with an iconic Maine dish that will certainly be one of the most unique and delicious items that you will find at a ballpark." Additionally, every Friday home game will be a Foodie Friday at the ballpark, where the Sea Dogs will offer a unique menu item each night with the option to pair the item with a $5.00 draft of a local craft beer. The Foodie Friday items will be available in the Park Avenue Plaza located on the first base side of the stadium, while supplies last. The Sea Dogs open the 2019 season on Thursday, April 4th at 6:00 PM at Hadlock Field against the Reading Fightin Phils. Tickets are available for all home games at seadogs.com and by calling the Sea Dogs ticket office at 207-879-9500.